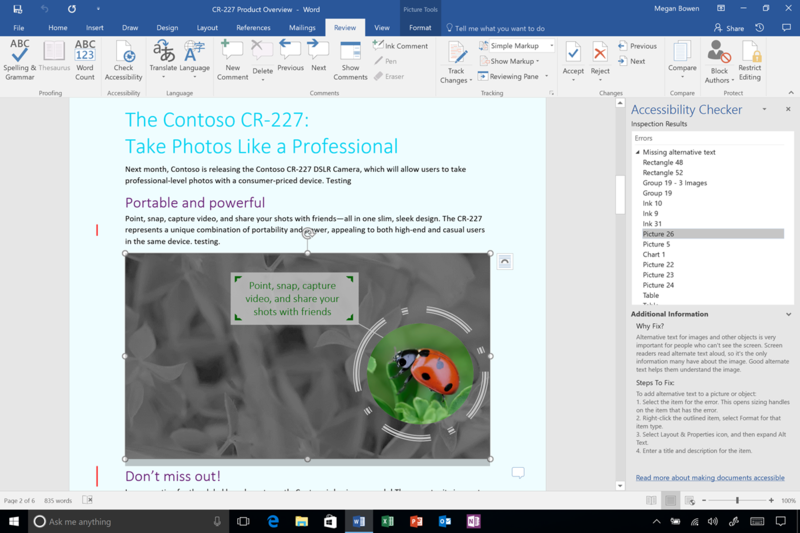 This month, there are several updates to the Office apps to help you more easily create accessible content and more. Read on for the details. Earlier this month, we covered a number of accessibility updates for Office 365 that help lay the foundation for a more inclusive digital environment. These improvements address both the creation and consumption phases when working with documents. Particularly noteworthy are the following capabilities built to empower all customers to create content that is inclusive and readable without friction. Accessibility Checker front and center—The Accessibility Checker is now easily discoverable in Word, Excel, PowerPoint, OneNote, Outlook and Visio, helping you ensure your content can be consumed without barriers by people with varying levels of vision, hearing, cognition and mobility. The Accessibility Checker analyzes your material and provides recommendations alongside your document, helping you understand how to fix errors and create more accessible content over time. Click Check Accessibility under the Review tab to get started. The Accessibility Checker is now easily discoverable, helping you find and fix issues that might make your content difficult for people with disabilities to consume. Availability: Accessibility Checker is now available and easily discoverable in Word, Excel, PowerPoint, OneNote, Outlook and Visio on Windows desktops. It is also available in several Office for Mac and Office Online applications. Intelligent alternate text for images—PowerPoint already leverages intelligent image analysis—including facial detection, color extraction and more—to optimize professional designs offered to you by Designer. 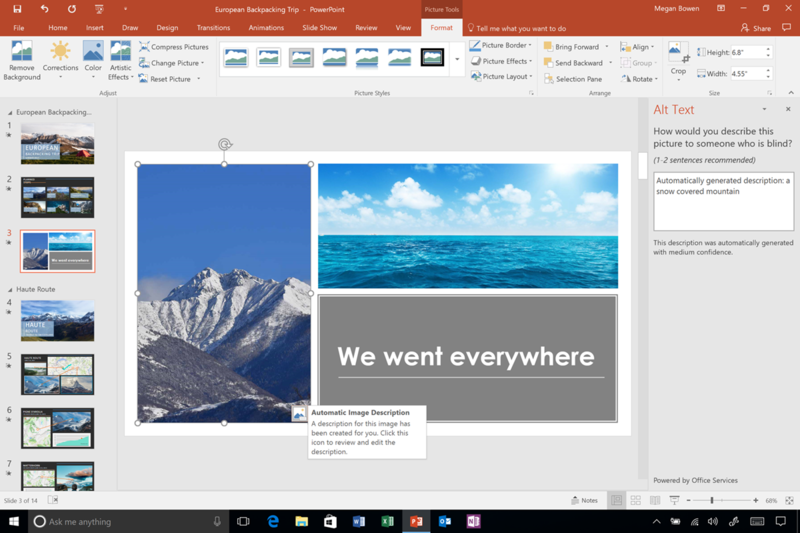 Soon you’ll get automatic suggestions for alternative text descriptions (alt-text) for images in both PowerPoint and Word, helping save you time and ensuring your media-rich presentations and documents can be understood by people with visual impairments. Powered by the Microsoft Computer Vision Cognitive Service, this capability will get smarter through machine learning as more people use it, and over time we will bring it to more apps and platforms. Stay tuned for more. Office will offer automatic alt-text suggestions with the help of intelligent image analysis. Availability: Automatic alt-text suggestions are coming soon in PowerPoint and Word on Windows desktops for Office 365 subscribers. Easily requesting accessible content in Outlook—Now you can enable a MailTip in Outlook on the web which alerts coworkers to your preference for accessible content. The prompt they see while composing email to you reminds them to run Accessibility Checker before sending. This helps ensure coworkers fix any issues that might make the content difficult for people with disabilities to consume. We’ll bring this capability to Outlook on Windows desktops in the future. Get started by visiting Accessibility preferences from the General tab of Outlook on the web settings. Enable a MailTip in Outlook on the web to alerts coworkers to your preference for accessible content. Availability: The MailTip requesting accessible content is currently available for commercial Office 365 customers in Outlook on the web. It is coming soon for commercial Office 365 customers in Outlook on Windows desktops. Easy and accessible hyperlinks—Soon you’ll be able to easily attach hyperlinks to recent cloud-based files or websites and simultaneously create more meaningful display names for people consuming your document using screen readers. Now when you click to insert a hyperlink, a Recent Items list similar to the one in Outlook will show your recently used files on SharePoint, OneDrive and OneDrive for Business, as well as webpages already copied to your clipboard. Once you select a link to insert, its file or webpage name—instead of its long URL—will automatically be added as the display text (which you can modify as you wish). A Recent Items list will soon help you easily attach hyperlinks with meaningful display names for recent cloud-based files or websites. Availability: The Recent Items list for hyperlinks in Word, Excel, PowerPoint and Outlook on Windows desktops is coming in the next few months for Office 365 subscribers. This capability in Office Mobile apps on Windows and Android is also coming in the next few months.